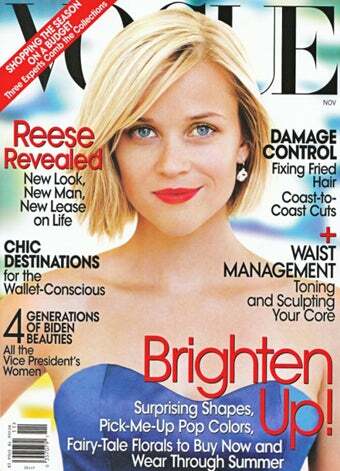 So Reese Witherspoon is on the cover of the November issue of Vogue. Yawn. According to the mag, she has a "new look." Oh, really? She looks like the same wholesome Southern deb she's always been. As for the story inside, it's just a lame, joyless advertisement for the cringe-inducing film Four Christmases and for Reese's friend/designer, Olivier Theyskens. (The latter, at least, belongs on the pages of Vogue.) But really, all this story does is confirm that Ms. Laura Jeanne Reese Witherspoon, whose father is an otolaryngologist and whose mother is a Ph.D. in pediatric nursing, is accustomed to getting everything she wants, Veruca Salt-style. Consider the story of the Christian Dior dress:Reese was in Paris in 2005, the day after her Oscar nomination for Walk The Line. According to Vogue, "She needed a dress. She wanted vintage." So her stylist drove her to this "out-of-the-way arrondissement" where a Christian Dior dress "made in the fifties for a princess, literally," was hanging in a shop window. Except! It wasn't for sale. Reese tried it on anyway. "It fit perfectly. I mean, like, it couldn't have been more amazing," she remembers, "and Nunzio is there and he's talking in French and finally the man said, 'You can have it.'" She wore it to the Oscars. She won an Oscar. "I don't mean to sound hokey pokey, but the dress has energy in it," she says. She will keep it forever. "My accountant got wind of the bill, and he called me and said, 'Um, don't you think you should auction this off?' And I'm like, 'Are you kidding me?' I will never ever ever ever ever sell it." You're like, whatever Dodai, you're mean, it's sweet, she's so lucky! She glossed over the part where she bought a dress that wasn't for sale. And she also said this: "I was one of the few people born to be June Carter Cash? I was the only person born to play her—I mean, me and June Carter Cash." So. It's just hard not to see her as straight-up Tracy Flick. Still, the pictures are nice!